Once home to large herds of bison, the point where Route 66 enters New Mexico was part of the hunting ground of the Comanche. The Comanche followed migrating herds of bison north to south and back again, from the area now known as Kansas across the present day states of Oklahoma and Texas and into the eastern edge of New Mexico. The first real stop on Route 66, Tucumcari, is named for a nearby mountain that Comanche warriors used as a look-out. According to linguists, the Comanche word for this spot is Tukamukaru, meaning “to lie in wait for someone”. Today, the Comanche Tribe is headquartered in Lawton, Oklahoma, and the first tribal lands a traveler will encounter in New Mexico along Route 66 are the Pueblos of Sandia and Isleta. New Mexico is home to 22 American Indian tribes—19 Pueblos and three Apache tribes, the Fort Sill Apache, the Jicarilla Apache Nation and the Mescalero Apache Tribe. American Indians make up more than 10 percent of the state’s population. Interstate 40 ascends, descends and curves through the ear-popping foothills of Sandia Mountain before the landscape flattens out and the city of Albuquerque fills the frame of your windshield. Traveling from east to west, the original alignment of Route 66 took a turn north outside of Santa Rosa to the New Mexico capital, Santa Fe. 66 picked up the end of the old Santa Fe Trail for 58 miles before dipping south and following the old Spanish El Camino Real toward Los Lunas. Sandia Lakes: The three Sandia Lakes are a catch-and-release fly fishing paradise. Each lake is regularly stocked with Rainbow Trout duing the winter and spring and with Channel Catfish in the summer and fall. A turn north off I-40 onto HWY 25 (which briefly aligns near Santa Fe with a segment of Route 66 decommissioned in 1938) and a short journey of about 15 miles leads to Sandia Pueblo. T’uf Shu Tu’, (“Green Reed Place”) the Native name for Sandia, is a site the pueblo has occupied since 1300. The pueblo became known Sandia (Spanish for watermelon) in the 17th century, a reference by Spanish settlers to the color of the sacred mountains at sunset. The traditional name of the people is Na Fiat. Today there are fewer than 500 enrolled citizens but they maintain their traditional way of government—employing a governor and lieutenant governor as well as a war chief and lieutenant war chief. The Tiwa language is taught and many citizens are tri-lingual, speaking Tiwa, English and Spanish. Bobcat Ranch is a privately owned ranch located in the Sangre Cristo Mountain Range and offers several hunting experiences to choose from, including guided elk and turkey hunts. Bien Mur, or “Big Mountain” in the Tiwa language, is named in honor of the majestic Sandia Mountains of the Sandia Pueblo reservation. The Bien Mur Indian Market, owned and operated by the Pueblo of Sandia, is the largest retail arts and crafts store in the Southwest and offers authentic handmade American Indian goods. For more information about special events, call 1-800-365-5400. 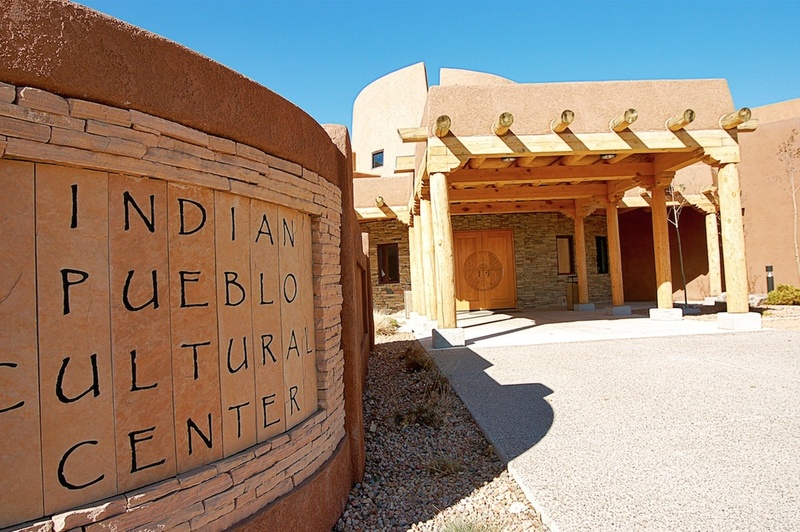 The Pueblo of Sandia includes a 107-acre bison preserve located just east of their Bien Mur Indian Market. Bison were nearly driven to extinction in the U.S. in the 1800s. In 1872, according to the National Park Service, an average of 5,000 bison were killed per day and their hides sold for less than $1.25 apiece. The greed of white hunters was partly to blame, but there was also an organized effort by the U.S. government to destroy the livelihood of the tribes who depended on the animals for food, shelter and tools, according to The Smithsonian Conservation Institute. By the 1900s, fewer than 1,000 bison remained. Many tribes have reintroduced bison back to their lands and according to the National Bison Association, more than 162,000 bison roam in the U.S. today. South of I-40 and west of Albuquerque lies Isleta Pueblo, or Shiewhibak (“flint kick-stick place”) in Tiwa, the pueblo’s native language. According to A Native American Encyclopedia by Barry M. Pritzker, the name Isleta (Spanish for “little island”) comes from the Spanish missions San Antonio de la Isleta and San Augustin de la Isleta. Founded in 1613 as St. Anthony, the St. Augustine Mission located in the center of the pueblo is one of the oldest Spanish mission churches in New Mexico. The building was found in ruins in 1692 but the walls could be used, so the church was rebuilt and renamed St. Augustine in 1716 after the patron saint of Isleta. The four feet thick adobe foundation walls are original to the site, which was restored from ruins in 1716 and named for the pueblo’s patron Saint, Augustine. It is the only place in Isleta that visitors are welcome to photograph. St. Augustine is open daily to visitors to explore. The people of Isleta hold regular worship services and parish events in the mission. Traditionally, the Tiwa speaking people subsisted on agriculture, bison hunting and trade with other pueblos. Situated on the Rio Grande and the historic El Camino Real, the Spanish “Royal Road” that connected Mexico City in the south to Ohkay Owingeh (San Juan Pueblo) north of Santa Fe, Isleta was a thriving community when the railroad arrived in 1881—forcibly taking the land and realigning Isleta Pueblo’s gathering grounds. When Route 66 subsumed a wagon trail through the pueblo nearly 45 years later, Isleta was again forced to give up ground. Later, after protests, Route 66 was moved across the railroad tracks and the Rio Grande, curving around Isleta to pass through Bosque Farms, Peralta, Valencia and Los Lunas. The I-40 frontage road west of Albuquerque leads travelers through Laguna Pueblo’s grazing lands. Traditionally known as the Ka’waika, Laguna (“lagoon” or “lake” in Spanish) is the largest Keresan-speaking pueblo. The Spanish named the area after a lake that is now a meadow, and people have lived here, it’s believed, since 1300. Ruins can still be seen among the rocks of the mesa. The current settlement has been occupied since before the Spaniards came in 1697. Today, Laguna’s business arm operates several successful enterprises, including the Route 66 casino resort just off I-40 and old Route 66. Laguna Pueblo elder and globally-renowned photographer, Lee Marmon, has been called America’s most widely respected Native American photographer. In 1936, at the age of 11, he snapped his first photograph—of a car wreck on Route 66 through Laguna. After serving in World War II, Lee returned home to Laguna Pueblo and bought his first camera. Since then, his photographs have been commissioned by celebrities, Presidents, the American Indian College Fund, movie studios, newspapers and magazines, and his images are exhibited around the world. In 2015, at the age of 90, Lee Marmon and his friend Tom Corbett co-authored Laguna Pueblo-A Photographic History, featuring over 70 years’ of Lee’s spectacular images, including a look at Route 66 and the cultural changes it brought. The book has won high praise, including two awards from the NM-AZ Book Co-op and a 2015 Southwest Book Award from the Border Regional Library Association. Lee Marmon’s archive of 90,000 negatives now rests at the University of New Mexico. Traditional Laguna pottery made a comeback in the 1970s. The designs are similar to those found in Acoma. The geometric patterns are created in red, yellow and orange pigments. Haaku—A Place Prepared—Acoma Pueblo is the oldest continuously inhabited community in the United States, dating back to at least 1150. The historic pueblo is perched in the sky atop a 367-foot sandstone bluff accessible only by a winding road that meanders away from I-40 through low scrubby rock strewn hills and monolithic outcroppings of stone. Most of the pueblo’s inhabitants live below the city in the sky, ascending only for ceremonials and feast days—or a little housekeeping. Acoma is known for its pottery. Traditionally created pottery is hand-colored and decorated in orange and black paints mixed from natural pigments. Women and girls would walk several miles from their villages to take pottery to a little general store (now in ruins) on Route 66 to sell. December 24: Christmas Eve Celebration - Luminarias light up the Pueblo from the Scenic View Point to Sky City. Acoma Pueblo has a tradition of pottery that stretches back centuries. Today, it is most known for a matte polychrome style of pottery featuring orange and black designs on a white background or black fine-line designs on a white background. Storytellers celebrate the pueblo tradition of passing down stories orally and usually depict an elder surrounded by children, all with open mouths to represent the act of storytelling. Haaku, or Old Acoma, is also known as Sky City. One of the oldest inhabited sites in the United States, Haaku is perched atop a 367-foot mesa. The reservation includes four other villages and covers 431,664 acres—a fraction of their original land base that covered 1.5 million acres and several villages. The tribe organized under the Indian Reorganization Act of 1934 but they did not adopt a charter or a constitution, preferring instead to maintain their traditional government. Sky City was designated a National Historic Landmark by the National Park Service in 1977.